Inspired by the outdoors, I seek to bring an essence of nature’s RHYTHMS (think: swaying grass, rolling waves, gliding clouds, blooming flowers…) indoors via paintings. The RHYTHMS series is made up of expressionistic brushwork and colors found in nature. They are created through ecotherapy in the great outdoors. I am happiest when I can paint barefoot in the grass. I strive for purity in creativity. I take risks with wild brush strokes. Sometimes the process, when left to chance in a stroke, splatter or drip, determine the uniqueness, character and beauty of a painting. I relish the risky moments of flying paint because it reminds me of what it is to be human and part of nature. It is within the flow of authenticity, that character (and original art) surfaces. We are literally biologically dependent upon nature. Healing energy is in the sun, the wind, the rain, the cycles… I strive to stay connected to nature and capture an interpretation of nature (both subject matter and process) through this work. 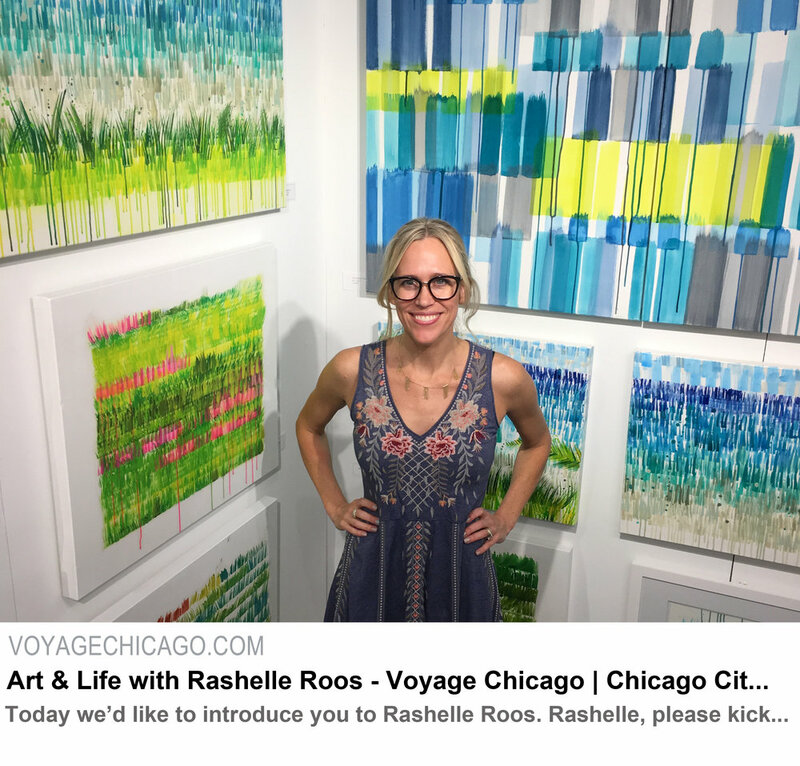 Rashelle holds a BFA from The School of the Art Institute of Chicago, an MFA in Painting and an MA in Middle Eastern Studies from the University of Illinois at Urbana-Champaign. She also studied at Bogazici University in Istanbul, Turkey, while teaching art at Copadam Atolyesi, in Istanbul, and conducting research on Middle Eastern art in the United Arab Emirates. Roos is the recipient of many awards, including 8 full fellowships, 6 artist and travel grants, and 3 international artist residencies [at Kapadokya, Turkey (twice) and Andros Island, Bahamas]. Roos has taught art in various capacities, from instructor of record at the university level, to art teacher for children after school. Roos then went on to earn an MAC in Art Therapy, and served as an art therapist for adults with chronic mental illness, and youths in juvenile services. She has participated in over 40 exhibits, nationally and internationally. Her art studio is in Miller Beach, IN, but she also loves to make art while traveling.